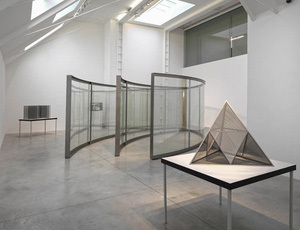 For fifty years, Dan Graham has traced the symbiosis between architectural environments and their inhabitants. 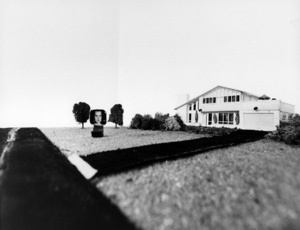 With a practice that encompasses curating, writing, performance, installation, video, photography and architecture, his analytical bent first came to attention with Homes for America (1966–67), a sequence of photos of suburban development in New Jersey, USA, accompanied by a text charting the economics of land use and the obsolescence of architecture and craftsmanship. 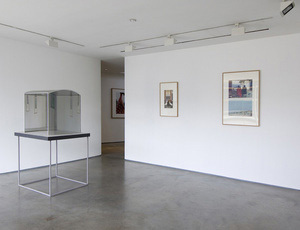 Graham’s critical engagement manifests most alluringly in the glass and mirrored pavilions, which have been realised in sites all over the world. 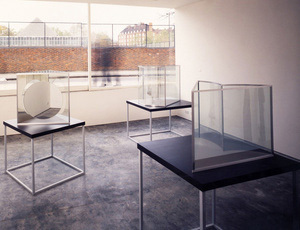 These instruments of reflection – visual and cognitive – highlight the voyeuristic elements of design in the built world; poised between sculpture and architecture, they glean a sparseness from 1960s Minimalism, redolent of Graham’s emergence in New York in the 1960s alongside Sol Le Witt, Donald Judd and Robert Smithson. 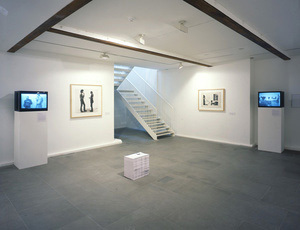 Graham himself has described his work and its various manifestations as ‘geometric forms inhabited and activated by the presence of the viewer, [producing] a sense of uneasiness and psychological alienation through a constant play between feelings of inclusion and exclusion.’ Considering himself first and foremost a writer-artist, Graham's writings and periodicals from the 1960s, including Figurative (1965) and Schema (1966), include published essays and reviews on everything from rock music and television culture to Dean Martin and Dwight D. Eisenhower's painting. These publications, predating Conceptual art, were a rejection of the limits of the art gallery’s ‘white cube’ format and an embrace of the ubiquity and disposable nature of monthly periodicals. 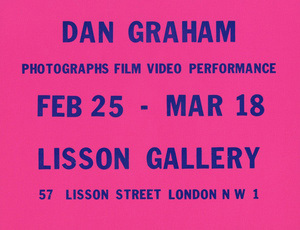 Dan Graham was born in Urbana, Illinois, USA in 1942 and lives and works in New York, USA. He has had solo exhibitions at Sirius Arts Centre, County Cork, Ireland (2018); the Red Brick Museum, Beijing, China (2017); the Museum of Contemporary Art, Zagreb, Croatia (2017); The Cleveland Museum of Art, Cleveland, OH, USA (2016); Columbus Museum of Art, Columbus, OH, USA (2016); MAMO, Marseille, France (2015); ETH Zurich, Switzerland (2015); Turner Contemporary, Margate, UK (2014); The Metropolitan Museum of Art, New York (2014); Kunstmuseum Sankt Gallen, St Gallen, Switzerland (2011); Center for Contemporary Art, Kitakyushu, Japan (2010); Museum of Contemporary Art, Los Angeles, CA, USA (2009); Castello di Rivoli Museo d’Arte Contemporanea, Turin, Italy (2006); Museu Serralves, Porto, Portugal (2001); Museum of Modern Art, Oxford, UK (1997); Van Abbemuseum, Eindhoven, The Netherlands (1993); Kunsthalle Berne, Bern, Switzerland (1983); and the Renaissance Society, University of Chicago, Chicago, IL, USA (1981). 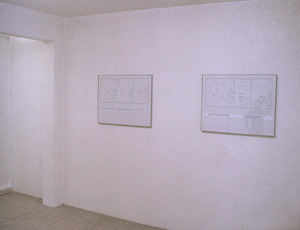 He has participated in dOCUMENTA 5, 6, 7, 9 and 10, Kassel, Germany (1972, 1977, 1982, 1992, 1997) and shown work at the Venice Biennale, Italy (1976, 2003, 2005). 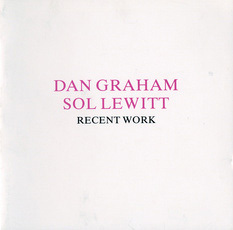 Among numerous awards he received the Coutts Contemporary Art Foundation Award, Zurich, Switzerland (1992), the French Vermeil Medal, Paris, France (2001) and was honoured by the American Academy of Arts and Letters, New York, USA in 2010. Print 74 x 93 cm / 29 x 37 in. 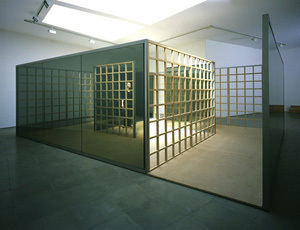 Stainless steel, perforated steel and two way mirror 230 x 520 cm / 90 1/2 x 205 in. Stainless steel and 2-way mirror, 230 x 350 x 748 cm / 90 1/2 x 138 x 295 in. Two way mirror glass, aluminium, cellulose, MDF 90 x 140 x 71 cm / 35 1/2 x 55 x 28 in. Two way mirror glass, aluminium, cellulose, MDF 107 x 107 x 42 cm / 42 x 42 x 16 1/2 in. Wood, MDF, glass, aluminium, and acrylic 107 x 107 x 44 cm / 42 x 42 x 17 in. Black & white photograph 74 x 86 cm / 29 x 34 in. 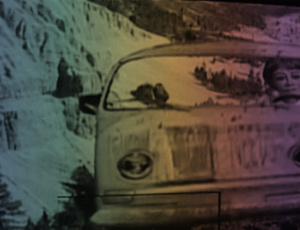 C-print 78 x 57.5 cm / 31 x 22 1/2 in. Pencil on paper 51.7 x 41.7 x 3.8 cm / 20 1/2 x 16 1/2 x 1 1/2 in. Zinc sprayed steel, two way mirror, clear glass and blue cypress trees 220 x 600 x 900 cm / 87 x 236 x 354 in. Two way mirror glass, plain glass, painted aluminium and stainless steel 205 x 208 cm / 81 x 82 in. Perforated Steel, stainless steel, two-way mirror 413 x 502 x 230 cm / 162 1/2 x 197 x 90 1/2 in. Two-way mirror, stainless steel 453 x 731 x 230 cm / 178 x 288 x 90 1/2 in. Pencil and watercolour on paper 62 x 53 x 3.8 cm / 24 1/2 x 21 x 1 1/2 in. Six framed and signed colour prints Framed: 74 x 68cm / 29 x 27 in. Two-way mirror glass, stainless steel, oak, PVC 636 x 479 x 209 cm / 250 3/8 x 188 5/8 x 82 1/4 in. Laminated glass, stainless steel 235 x 827 x 508 cm / 92 1/2 x 325 5/8 x 200 in.